A simple and easy way to surprise family and friends with floating balloons for a gender reveal. Follow these easy steps and create your own. Step 1: Find a box big enough to hold ideally 4-5 balloons. Size of the box can differ based on what type and size of balloons you want to add inside. Try using bigger boxes for the foil balloons so they don't get stuck when trying to float out. I tipped my box over and cut it on that edge to make it taller. Try opening and closing the box to find out whats comfortable with you to determine the front side before you decorate. You can use brown craft paper to wrap your entire box to cover any writing or logos when repurposing an old box (brown paper bags work too, although you may see the folded lines). Step 2: Decorate your box. Next you'll need at least one big giant black poster board for your heart. Ideally, your heart should expand the entire length of the front. This is where you can get creative. I went with the simple phrase, 'Boy or Girl'. 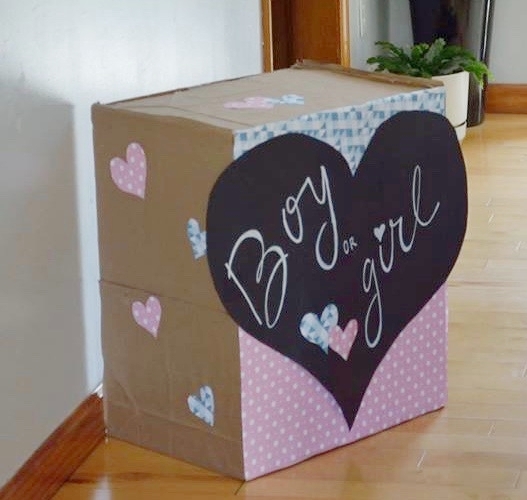 Others have written, 'Boy or Girl Open to See' or 'Surprise Inside'. Choosing different colored chalk markers can also brighten up the black poster board (I just went with traditional white). I also added scrapbook paper in both blue and pink patterns to make it more colorful on both the front and heart cutouts on the sides. You can find these sheets at any craft store (my go to store is Michaels) for $0.49+ based on design, weight, style ect. Don't forget to download coupons so you can get it for even cheaper! Step 3: Add your balloons. You can always have the person blowing up your balloons to add more or less helium based on the size of your box so they can all fit freely inside. I sized the ribbon long enough for it to float just above us so it won't be too short or too long when attached to a heavy weight inside. We went with 3 regular baby blue balloons and one foil balloon that said 'It's a Baby Boy'. The lid to our box fit snug on top without floating open but you can make sure that your lid doesn't unexpectedly fly open too early by tying a ribbon around to add a little more decor. Step 4: Open the box to surprise family and friends on your bundle of joy!